In this story, Billy adopts two orphaned owls (Wol and Weeps). He also adopts other stray wild animals. 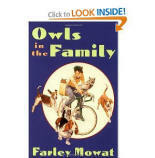 Billy, his family, and his friend Bruce have to deal with the challenges of raising the owls, since they can no longer live in the wild. Billy and the owls cause plenty of problems for the family. The boys can’t find owl eggs. At first the owls don’t trust Billy. Wol and Weeps don’t know how to fly. Wol breaks open the cage. Wol scares the mailman and minister. Billy and his family are moving to the city and can’t keep the owls. Design a habitat for the Owls so they can live in their new home. Wol can use his talons to break the chicken wire of his cage. Prior knowledge: During the lessons, students will read nonfiction books about Great Horned owls to find out the requirements for the enclosure. Students explanation of their cage will have to include information about Great Horned owls. As an extension, students could calculate the area and/or volume of the different enclosures.